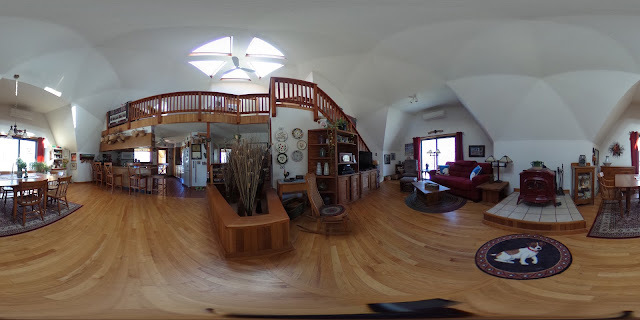 I recently purchased a Ricoh Theta S, a camera with two fish-eye lenses, which creates both 360 degree spherical panoramic images as well as spherical videos. You can find out all the information about the camera on the Ricoh site here. The images taken with the camera, when imported in Photos on the Mac, look like this. When you run them through the Ricoh Theta app (available for Mac and Windows), they are turned into spherical panoramic images. These images then live on the Ricoh Theta360 where they can be shared with other via the URL or embedded in a site using embed code, like the one below. The images can be rotated in any direction using a mouse (or a finger on a touchscreen or tablet) and be zoomed in and out. However, I did not necessarily want to host the images on their site. I did a lot of searching around, and there were bits and pieces of how to host the images somewhere bu I could not find a definitive solution. My son, Rockwell, located the Pannellum page which, if you host your images on Imgur or in Dropbox, you can make the same spherical panoramic images and give you the embed code to use or share with others. Make sure your Ricoh Theta M camera is set up not to remove the photos when downloading them to your smartphone. Take your pictures with the Ricoh Theta M.
Hook the Ricoh Theta M up to your Mac via the USB cable. Resize the images to 4096x2048 pixels. Put the images online somewhere where they will have a URL and can be shared. Put the URL of your hosted image in the panorama URL box (real URL from Imgur and take off the "?dl=0" from the Dropbox image URL), add a title and author if you wish, check the autoload box, and generate the panorama. Below is the filled-in form. And below you will see the embed code version of the spherical panorama via the code from the Pannellum site. Take a field trip to Peru!